Practice with the present continuous negative tense for beginners. Silly Saturday interjects some humor into a routine grammar worksheet. Students are to focus on the helping verbs that are so important. The present downloadable worksheet is best suited for high school students, elementary school students and adults at Beginner (pre-A1) and Elementary (A1) level. 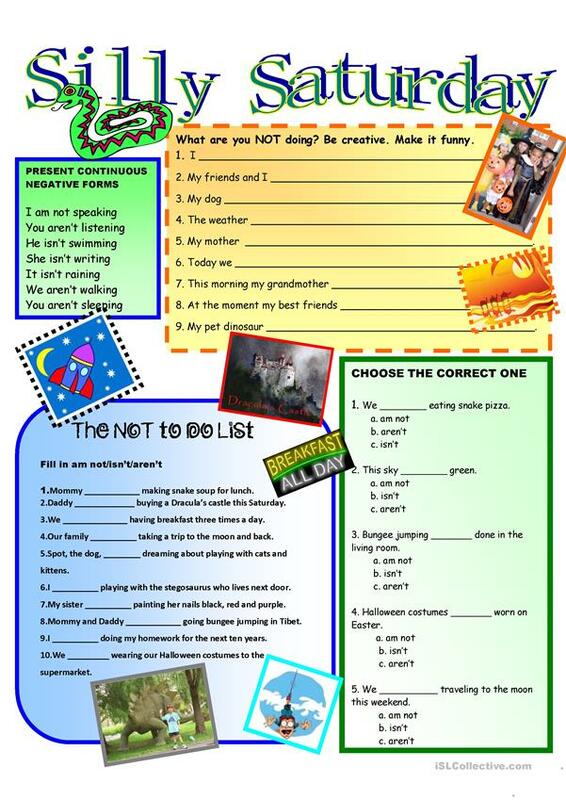 It is great for teaching Present continuous (progressive) tense in English. It focuses on the topic and words of Humor. kifissia is from/lives in United States and has been a member of iSLCollective since 2011-10-12 07:37:58. kifissia last logged in on 2019-04-21 04:52:38, and has shared 385 resources on iSLCollective so far.